The Mormons started the old town of Macedonia on the West Nishnabotna River (a mile west of the present town site) in 1846. Sometime later, the Methodists held services in a school house until 1873 when it was officially organized with a membership of about 15. Rev. Henry DeLong, a resident of Council Bluffs, Iowa, was the first minister. He rode his horse to preach each Sunday at Macedonia (about 30 miles from Council Bluffs) for $800 a year. In 1875, a building was erected "on the flats" in Old Macedonia. The town was moved to the present location when a branch of the Chicago, Burlington, and Quincy Railroad came through. New Macedonia unofficially was started July 4, 1880, and officially incorporated 12 years later, in 1892. With the population moving away from the old town, it was decided to sell the old church building and move to a more favorable site in the new town. Following the sale of their old building at Old Macedonia, the Methodists used the Cumberland Presbyterian Church in New Macedonia, alternating Sundays with the Presbyterians. This arrangement continued until the completion of the Methodist Church on August 13, 1882. A railroad construction camp stood on the property where the new building was erected and now owned by the present United Methodist Church in Macedonia. Someone started "The Lone Wolf Saloon" in one of the unoccupied buildings. A farmer and a shoemaker held a prayer meeting in the saloon one night, and the next day the owner of the Lone Wolf left town and was lost from sight. A new church was erected on the site of the saloon in the year of 1882, at a cost of $3,000, with a bell tower 70 feet high. There were around 60 members at this time. In 1900, the building was remodeled. 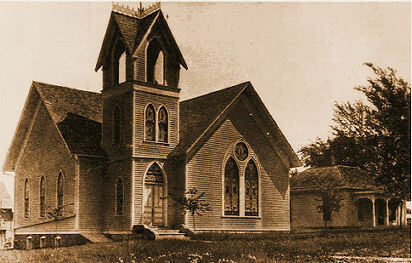 It continued to serve the community until the fall of 1929 when it was torn down to make room for the present building. The parsonage was sold and moved to the south part of the town and is still standing. During construction of the new building, the membership again worshipped in the Presbyterian Church. Uncle John Hamilton was a wealthy farmer and an atheist who lived just outside of Macedonia. One day, the minister knocked on his door. John opened the door, saw who it was, and said to him, "What are you doing HERE?" The minister said, "I am distributing Bibles to the heathen, and here is one for you." Uncle John got a big laugh out of this, and from this encounter they developed a friendship which eventually resulted in him giving $45,000 to build the present building and purchase the wonderful pipe organ. At the time of his death, much of Mr. Hamilton's estate was bequeathed to the church, the city and school of Macedonia, and to Simpson College in Indianola, Iowa. He was truly a philanthropist with a big heart. The cornerstone of the present Macedonia Methodist Church was laid on April 9, 1929, and was dedicated by the Bishop on October 12, 1930. We became the Macedonia United Methodist Church with the unification of the Methodist Church and the Evangelical United Brethren Church in 1968.